An artist's conception of HD 189733b, which some have dubbed the "Bulls-eye" planet because of the bright "hot spot" shown here. The first-ever temperature map of a world outside our solar system confirms some extrasolar planets are heated by supersonic winds that ferry heat from their day sides to their night sides. The map, detailed in the May 10 issue of the journal Nature, has implications for a large class of giant gas planets that orbit very close to their suns, called "hot Jupiters." The mapped planet, HD 189733b, orbits a star located 60 light-years away that is slightly cooler and less massive than our Sun. It orbits its star at a distance of only 3 million miles; one year on the planet is equal to only 2.2 Earth days. HD 189733b is a so-called "transiting" planet, meaning it passes directly in front of its star as seen from Earth. Like other hot Jupiters, HD 189733b is also tidally locked to its star, the way the Moon is to Earth, so only one side of the planet is illuminated by its star. Using an infrared camera on board NASA's Spitzer Space Telescope, Heather Knutson of Harvard University and her team observed HD 189733b as it passed in front of its star, collecting more than a quarter million temperature readings of the system over a period of 33 hours. Because the planet is so far from Earth and so small compared with its star, the researchers can only measure the total light from the planet-star system. "We looked for a change in that total light," Knutson explained. "If the night side is cooler and the day side is hotter, then as the day side rotates into view, you see an increase in the amount of light from the system." Differences in the system's total light while HD 189733b was at various points in its orbit were translated into temperature differences between the planet's day and night sides. The hottest region on the planet is a single hot spot on the day side of the planet that is twice as big as the Great Red Spot on Jupiter and a scorching 1,700 degrees Fahrenheit (926 degrees Celsius). Surprisingly, the hot spot was not located at the "high noon" point on the planet, where the star is directly overhead, but instead is shifted over some distance to the East. "It's a fairly big shift. On Earth, it's equivalent to the distance between Seattle and Chicago," Knutson told SPACE.com. The shift is likely due to supersonic winds on the planet, which can reach speeds of 6,000 miles per hour (9650 kph)-nearly 8 times the speed of sound traveling in air. "The best way to picture it is you have this belt of winds circling around, and as it comes past this high noon spot, it's taking this patch of hotter gas and kind of sweeping it downwind," Knutson explained. The coldest region of the planet is about 1,200 degrees F. The 500-degree difference is relatively small for a hot Jupiter, leading the researchers to suspect the supersonic winds are redistributing the heat from the planet's day side to its night side. "We know from the small temperature difference there is something mixing things up in the atmosphere," Knutson said. "So the fact that we see this shifted patch of hot gas ties into that story." "This isn't just the case where you need winds, but winds that are fast enough to move air from one side of the gas giant planet to the other before it has time to cool off," said study team member Adam Showman of the University of Arizona. It is still uncertain at this point whether global gales redistribute heat on all hot Jupiters. 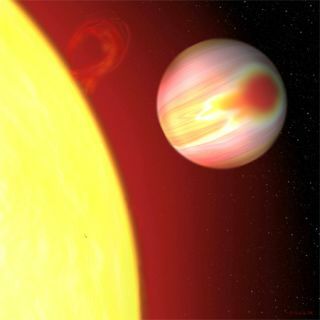 Another team, for example, recently found evidence that supersonic winds on one hot Jupiter are not strong enough to warm its night side, and so the world is scorching hot on one side and freezing cold on the other. HD 189733b could be typical of most hot Jupiters, "or it could be there's a big variation between different kinds of planets," Knutson said. "That's the next thing we're going to do, to look at a second planet that has different properties and see if it still has winds or not."